Doctor visits can be a hassle. There are scheduling conflicts, the inevitable waiting room times and the limited time spent with a doctor after that long wait. Wouldn’t be nice if you could magically bypass all these time wasters? Governors MedSpa & Concierge Medicine will be offers valuable solution to these common healthcare challenges. Governors MedSpa & Concierge Medicine will provide the highest level of personalized and preventative care. Annual physicals, coordinating labs and radiology and other specialized tests as needed, coordinating care with specialists, same day appointments and prescription refills, triaging unexpected hospital visits and sharing the latest medical advancements and releases of new drugs that impact you are the hallmark of what we do. Upon joining our practice each patient will undergo a full evaluation related to health needs and life style issues. Attention is given to assess not only your current medications but also, more importantly, how lifestyle impacts your wellness. Many people live complicated busy lives that often impact diet, exercise, sleep habits, and even medical care. For that reason, we will approach your health from a living perspective not an illness perspective. Your journey as a Governors MedSpa & Concierge Medicine patient will begin with a complete medical history and a review of prescriptions and procedures followed by a complete physical examination and then a full profile of labs and testing depending on your history. It is imperative that the team knows as much as possible about each patient needs and preferences, and a pulse on what level of nutrition and fitness each patients is striving to attain. In addition to sick and wellness visits, Governors MedSpa and Concierge Medicine will also coordinate all lab testing and interpretation, all radiology testing and interpretation, and necessary triaging of hospital and other physician specialist visits. Patients are granted 24 hour access to healthcare and same day appointments when necessary, as well as, same day prescription refills. Dr. Heath and Dr. Ashley will be available to discuss your disease management, talk with any specialists you are currently seeing in an effort to have complete and accurate information, and to discuss current prescriptions and alternative solutions among many other services. You will have immediate access to a provider by text messaging 24 hours a day, 7 days a week. If it’s the weekend and you develop a mysterious rash, discover a new mole or get a bug bite, simply send a quick text with a picture for immediate response. A dedicated phone line accessible only to the “Governors” plan patients will allow for same day appointments and priority care. If you happen to be out of town or simply are not able to come in for an appointment, you have the option of requesting a Skype or FaceTime video consultation. In addition, ALL minor office procedures including mole removal or joint injections are all included free of charge*. If pathology is needed a fee will be assessed. All office visits as frequent as necessary are free, NO COPAYS and NO HIDDEN FEES ever. Annual physical with labs included once a year. Additional labs requested or needed will be charged at a discounted rate. Prescriptions will be written promptly with NO additional fees. If you happen to be out of town or simply are not available to come in for an appointment, you have the option of requesting a Skype or FaceTime video consultation during office hours. After hours teleconferences may be scheduled for a fee. All office visits are free, NO COPAYS and NO HIDDEN FEES ever. You will receive 10% discount on all aesthetic services and skin care products. We will be seeing a limited number of patients on a self-pay basis. The “Citizens” (pay as you go) fee is due at the time of service and a credit/debit card number is required to schedule your appointment. New self-pay patients will be asked to pay $150 for the initial visit followed by the fee scale outlined above each subsequent visit. For self-pay patients, all office visits will be by appointment based on availability. In the event that an office visit exceeds the agreed upon time limit you will have the opportunity to reschedule for another day. FMLA, Disability papers, Biometric Screening forms, injections and prescription refills are $25 between appointments. For those without insurance, select prescription medicines, laboratory testing and some imaging studies are available at a discounted rate. 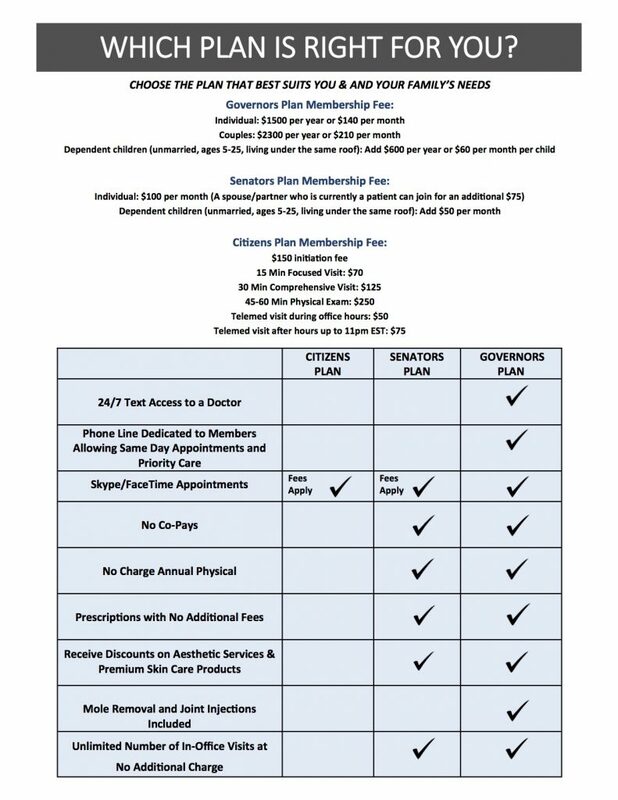 This plan has LIMITED ENROLLMENT – Under this agreement, the annual membership fee is paid in full at time of enrollment for a reduced rate or a monthly automatic withdrawal for 12 months commitment. In return, you will be granted IMMEDIATE ACCESS to all existing and future Governors health care benefits. This plan is paid by cash, automatic credit/debit card or electronic withdrawal monthly. On this plan, we will be available during regular office hours 9-5 Monday through Thursday and 9-4 Friday. You will receive priority, next day appointments that can be scheduled on an “as needed” basis. If you happen to be out of town or simply are not available to come in for an appointment, you have the option of requesting a Skype or FaceTime video consultation during office hours only. After hours phone conferences can be scheduled for a fee. Annual physical with labs included once a year and additional labs requested or needed will be charged at a discounted rate. Laboratory testing and imaging studies (X-rays, MRI/CT scans) on your behalf. This same profile would cost only $175 for plan members. Individual tests are even less expensive, making frequent testing affordable for almost anyone. For example, if you alter your diet, change medication or are simply curious about your cholesterol, these individual tests can be obtained for less than $25. We recognize that your privacy is preeminent. Consider that our laboratory service is the most secure and confidential way to be tested for virtually anything without divulging private medical information to your employer, health or life insurance plan! Alternatively, you can continue to use your current insurance plan for laboratory testing or imaging studies if you so choose. We will continue to order imaging studies and any necessary lab tests on your behalf regardless of what method you choose. None of the Governor Concierge plans are insurance plans nor are they substitutes for health insurance. You should still maintain your present plan or purchase a high deductible catastrophic care plan. You will need coverage for hospital care and any care provided by anyone but me. If you would like to submit a claim to your insurance company for reimbursement, we will provide you with an appropriately coded invoice(superbill) to submit to your insurance company. Insurance companies will most likely reimburse on the out-of-network basis.